The picturesque Villa Ephrussi de Rothschild, an exceptional site on narrowest part of Saint-Jean-Cap-Ferrat peninsula, overlooking the Bay of Villefranche on one side and the Bay of Beaulieu on the other, holds one of the most sought after settings on the French Riviera. With 156 000 visitors in 2014, the Villa Ephrussi de Rothschild is now one of the top three cultural locations visited along the Côte d’Azur. Every Spring, the “Roses and Plants Festival” welcome about 6 000 visitors during a week end. The French Riviera – a name evocative of luxury and wealth. A concentration of elegance occupying a few kilometres between sky and sea. This was an idyllic location for Béatrice’s imperious designs. Appreciated not only for its beauty but also for its proximity to Nice and Monte Carlo, during the Belle Epopque, Cap Ferrat attracted the international elite, who wintered on the Riviera. In 1905, Madame Ephrussi de Rothschild acquired seven hectares of land on the narrowest part of the isthmus. This was a purchase made right under the nose of King Léopold II of Belgium, who would have liked to have extended the land surrounding his neighbouring villa to include this Garden of Eden. Villa Ephrussi de Rothschild was built in rose pink and every room had to be pink like the mythical rose itself. Madame Ephrussi worshipped this colour. After all, her villa in Monte Carlo was even called “Rose de France”. In building the Villa, she combined the talents of a wide range of experts and businessmen, who were family friends. They must have provided her with excellent and effective advice judging from the rooms on display here. So began her exhilarating and discerning search across the globe and these searches bore fruit: the Baroness ordered works to be brought to Beaulieu by train and made her selection on the station platform. In fact, one day, she bought chapel ruins only to keep one fresco! The Villa is surrounded by nine magnificent gardens with patios, fountains, ponds, flower beds, shady paths and rare trees. These are the Florentine, Spanish, French, Exotic, Stone, Japanese, Provençal, Rose and Sèvres gardens. 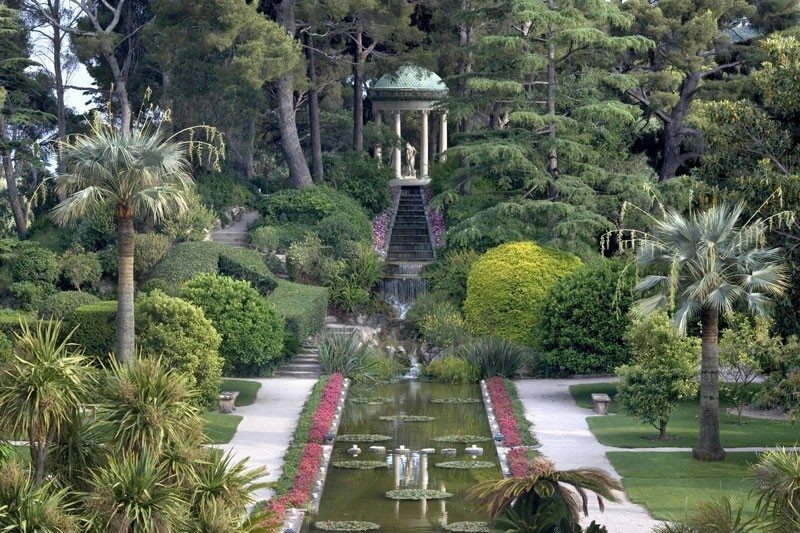 The gardens took seven years to complete, from 1905 to 1912. Just as for the design of the Villa, well-known names were enlisted, such as Harold Peto or Achille Duchêne. A highly esteemed landscape gardener in Europe and the United States of America, he built his reputation on creating classically inspired gardens. With wonderful scents and varied species, the diversity of plantations delights visitors, who are amazed and enchanted by this magical garden. When you enter this Garden of Eden, you embark on a trip around the world. A transatlantic cruise. The French Garden stands above all the others, both in size and location. It runs directly in front of the Villa. From the building, the view is outstanding and magnificent, ending in the Temple of Love. This exact replica of the one at the Trianon overlooks the stepped waterfall. The sloping structure of the waterfall was especially designed to make the water look white, the famous Oriental “water shawl”..
From the garden, there is a unique view of the palazzino for art lovers. In summer, lotus and water lilies cover the large ponds. The lawns, decorated with classical clay pots and large vases from the Italian Renaissance, are perfectly laid out. On the East terrace, Catalan sculptures await, serene and placid, knowing they will not fail to impress visitors, who are filled with wonder at this flourishing and yet so structured display of nature. By descending the great steps, visitors arrive at the Spanish Garden. Datura, arums and honeysuckle exude their heady perfumes, reminiscent of Aranjuez. At the bottom of these steps is a grotto, concealed behind pink marble columns. Another subtle touch in this enchanted place. At the centre of the grotto is the dolphin fountain. This sets off the pond lying at the foot of the pergola, adorned with Catalan amphorae and a Gallo-Roman bench. A timeless moment in the shade of the columns. Beyond the pond and pergola, overlooking the Bay of Villefranche, is the Florentine Garden and another change of scenery. At its centre, a wide horseshoe staircase frames a rocky grotto. Behind the philodendrons, water hyacinths and papyrus, a marble ephebe averts his gaze from the view before him. Following the Florentine path, lined with cypresses, visitors come to the Stone Garden. A strange, intriguing spectacle with a collection of works of art from various areas and periods. Amongst camphor and California laurel trees, there is a varied collection of works, which the Baroness was unable to accommodate inside the Villa Ephrussi de Rothschild: arches, fountains, capitals, bas-relief from the Medieval and Renaissance periods, monstrous gargoyles, grotesque figures in stone, Provençal and carnival gnomes. The Japanese Garden or “Cho-Seki-Tei” (meaning “Garden where one peacefully listens to the pleasant sound of the waves at twilight”) immerses visitors in a zen-like world where each element symbolises the spiritual microcosm. Designed and completed by Professor Shigeo Fukuhara, this Japanese garden contains the traditional wood pavilion, bridge, lanterns and bowls, illustrating more than one thousand years of Japanese tradition and ensuring an atmosphere of calm. Stepping stones cross a little stream to arrive in the Exotic Garden, a world of agaves and giant cacti. Whether alone or clustered in groups, they are starkly outlined against the blue sky. A very impressive sight! Finally, the crowning glory in this explosion of greenery is the Rose Garden. Many varieties of the Béatrice’s favorite flower fill this far end of the garden with fragrance. A secluded corner with its small hexagonal temple and, at the centre, its sole occupant is a gracious deity. A young girl who laughs at the seven columns surrounding her. Also not to be missed are the Provençal Garden located at the eastern edge and finally the Sèvres Garden where the tour ends in front of the tea room. Béatrice imperiously demanded excellence. Between 1905 and 1912, no less than ten architects came and went, having patiently listened to the Baroness’s grievances. From the four corners of the world, they created a residence reminiscent of many places. Florence, Venice and Ravenna were their points of reference, not forgetting the patios of the great Spanish palaces. Construction work of Villa Ephrussi was finally completed in 1912, after many crises and incidents, one of which almost cost the Baroness her life; a strong gust of wind brought the scaffolding down on her whilst she was personally supervising the building site. The result is no less grandiose for all that. Now the Baroness was able to have all the splendour from the greatest periods in history under one roof. A temple of refinement. The rooms and private apartments of the Villa exhibit, in the atmosphere of a home, great works of art, which Béatrice Ephrussi de Rothschild had collected throughout her life, bearing witness to her taste for art and travel. There is an amazing contrast between the rooms used for receptions and presentations and Béatrice’s private apartments. Although still splendid and with the same sophistication, they nevertheless maintain a certain cosiness. Rooms where all traces of formality seem to have been banished. The surprisingly large patio is a triumph of eclectism. Pink marble colonnades from Verona support immense arches, evoking the Italian villas of the Renaissance. The patio, where Béatrice hosted her elegant receptions, displays a number of medieval and Renaissance works of art. It contrasts sharply with the surrounding rooms, which are a testament to Béatrice’s passion for French XVIIIth century masterpieces. With its sumptuous furnishings, entirely restored by the Friends of the Villa, this is the villa’s most impressive room. The 18th century painted wood panelling originally came from the Hotel de Crillon in Paris. This room contains many pieces of royal or aristocratic origin: one of the carpets was ordered by Louis XIV for the Grand Gallery in the Louvre while the other, bearing the monogram of Louis XV, came from the royal chapel at Versailles. The ceiling is adorned by a canvas painted by the Venetian Tiepolo depicting the chariot of Venus drawn by doves. One of the room’s true gems is Marie Antoinette’s whist table, decorated with pearls, with its scrolled base. Nestled in two alcoves adorned with pearl grey wood panelling are tapestries from the Manufacture des Gobelins depicting scenes from Cervantes’ Don Quixote. The walls boast several superb paintings including “L’amour aux colombes” by François Boucher and “Diane sur les nuées” and “Le sommeil de Vénus” by his studio and Frédéric Schall’s enchanting dancers. The Baroness’ private apartments are alive with her presence to this day. Each room is richly decorated with a refined choice of furnishings. The visitor first enters a boudoir adorned with neo-Pompeian wood panelling. The lady’s writing desk was crafted by Jean-Henri Riesener, official cabinetmaker to Marie Antoinette and one of the principal suppliers of royal furniture under Louis XVI. However, the rarest piece is a little octagonal table, undoubtedly the work of Adam Wiesweiler, whose animal scenes were created using real bird feathers and insect wings placed on a wax background. In addition to its fine antique furniture and Venetian painted ceiling, the Baroness’ bedroom contains a number of costumes dating from the reigns of Louis XV and Louis XVI, together with a stunning collection of 19th century Chinese clothing and little shoes. The adjoining bathroom is a masterpiece of refinement: concealed behind the Leriche painted wood panelling (late 18th century) are a sink and storage compartments. Through the art dealers and experts she befriended, Baroness Ephrussi de Rothschild sought out works of art across the world. She made the Villa at Saint-Jean-Cap-Ferrat a collector’s home demonstrating her eclectic taste where porcelain, paintings by old masters and pieces of furniture were harmoniously placed side by side. The Fragonard Room contains 18th century furniture : a Saulnier writing desk, Milanese wooden furniture painted with a double eagle motif. There is no doubt that the painter from Grasse would have found this an appropriate setting for his etchings and drawings. Judging from how perfectly preserved the works are and the atmosphere in this room, the Baroness was a great admirer of this artist of genius. How could she resist this great man’s drawings (“Femme se mirant dans un cours d’eau”, “Danaé visitée par Jupiter”, or “S’il m’était aussi fidèle”…) ? Like the owner, visitors can also be charmed by “la Jeune fille à la rose” by François Boucher. The Monkeys Room: evidence of the Baroness’s playfulness? A delightful reference to the 17th century? Perhaps, but most certainly a homage to these little animals the Baroness loved so much. This monkey motif sums up Madame Ephrussi’s cultural and intellectual aspirations: It shows her passion for the 18th century, as well as her propensity for originality. In the 18th century, fables and animals were very popular. Therefore, Jean-Baptiste Huet, painter of wainscoting, moved away from the fashionable chinoiserie, preferring these monkeys mimicking human failings. A light-heartedness that so befits the Baroness. This same sense of humour is evident in the Meissen porcelain: little costumed animals playing musical instruments that the visitor is unlikely to forget! Finally, the Far Eastern Art Room, in the style of a late XVIIIth century chinoiserie study, has gold and lacquered doors originating from the Imperial Palace in Peking and a display of Cantonese enamelwork of rose quartz and precious white jade. By road: access by the lower cliff road (RD6098). A free car-park is available on the site. GPS coordinates: latitude 43°6945937 – longitude 7°3292327. By bus: lines 81, “Plage du passage” stop. Offers for families: free entry for the second child aged 7 to 17 when two adults and one child entries have been bought. Reduced rate for children aged 7-17, students, teachers and unemployed (on presentation of written proof). Free for children under the age of 7 and journalists (on presentation of written proof).